After over two decades as a band and the deaths of a couple of key members, The Charlatans prove that they remain the masters of the rock music with a delectable groove, soulful vocals and a bit of funky vibe. Their latest offering is Modern Nature, which offers that and a good bit more. This is the sound of a band that is doing more than just defending their place in pop music; it is the sound of a band that continues to refine and push the boundaries of their music. Building on their foundations, including welcome elements of the Manchester sound, the band infuses the new collection of songs with warmth and optimism (e.g. "So Oh" and "Come Home Baby"). Still relevant, still exciting, this is another triumph from The Charlatans. The Charlatans are Tim Burgess, Mark Collins, Martin Blunt, and Tony Rogers. Modern Nature is out now via BMG Chrysalis. The album is available as a digital download, CD or on vinyl. There also are deluxe CD and vinyl versions with bonus tracks. I can't claim to knowing much about Belfast's Pleasure Beach, but any band that makes a song like "Go" is a band from which I want to hear a lot more music. The members are Lisa, Kat, Alan, Richard and Rachel (yes, that means either Alan or Richard is missing from the above set of photos; you'll just have to get over it). Apparently the five songwriters only formed the band earlier this year. "Go" will be paired with "Absentee" for Pleasure Beach's first single, set for release on May 25th. To my ears, there is a bit of the clean Scandinavian pop anthem sound to "Go". Very promising stuff, I think. 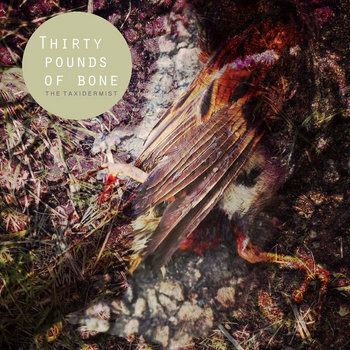 The Taxidermist is the fourth album from Thirty Pounds of Bone, the performing name assumed by multi-instrumentalist Johny Lamb. Lamb's reputation is built on his version of melancholy folk. But for this outing the man broadens his scope in chamber pop, soft-focus psychedelic and even shoegaze, directions. Several tracks boast distorted guitar and layered waves of sound, and there is a gauzy filter to the production. Moreover, his thematic focus on life, love and death seems to come from a less melancholy place. I don't know whether Lamb is newly happy, or whether he just has decided to express his sentiments more directly. In either case, he has crafted and album that is bursting with feeling and life, and written very appealing songs to carry his message. Lamb was born in Scotland's Shetland Islands, but now resided in Cornwall, where he recorded The Taxidermist. Remarkably, Lamb played all of the instruments and provided all of the vocals. The album is out now via Scottish label Armellodie Records on vinyl and as a digital download, and you can stream and buy it at the Bandcamp link below. An example of the more shoegaze/dreampop approach are "Before I'm Done", "All Your Sons", and "Expelled". "Two Birds in the Brine" and "Your Walk" are more representative of Lamb's acoustic folky side. If you already are a fan of Thirty Pounds of Bone you probably need no further encouragement to investigate this release. If this artist is new to you, I think yo will find this to be his most accessible work to date, and well worth your time. When I was a kid, back in the days of vinyl, my desire to go to the record store outpaced my ability to buy anything once I got there. I could only afford maybe one new record a month, even if Record Bar had them on sale. The solution to this problem was the cut-out bin -- a couple of shelves of remaindered records that usually were half price or less compared to the new stuff. I got a ton of music out of the cut-out bin. A lot of it was crap, like Tormato by Yes. I should have known that when I saw Roger Dean hadn't done the cover art, so I'm not complaining. Some of it, though, was life-changing. I bought the first Black Sabbath album out of the cut-out bin. I was probably 12, and had never heard Black Sabbath before, except the song "Paranoid" was on a Don Kirshner compilation album my mom bought me when I was 10. You can only imagine the effect that first song, "Black Sabbath," had on a kid my age. I have never listened to music the same way since. I still rummage from time to time through the latter-day version of the cut-out bin -- the $5.00 album listing on Amazon. There's some great music to be found there. Some it is famous -- I bought a Marvin Gaye album out of the five buck bin a couple of months ago. Some of it is more obscure, like one of my favorite albums I bought last year, Dead Roots Stirring by Massachusetts trio Elder. That album didn't make my 2014 year end list for one simple reason -- it was released in 2011. It did, however, get played unrelentingly for months. And for months, as well, I kept a lookout, trying to see what had become of this terrific band, finally to learn that they had a new album, titled Lore, set for release in late February. I bought it the day it was released, and after dozens of runs through its hour long, five song cycle, I love it more than ever. It is truly a revelation. Even more than being a "metal" album, which it clearly is, this is a guitar album. Nick DeSalvo is an incredibly gifted young musician who, thankfully, also has a tremendous sense for composition. These songs are long, but they fly by. There are no dead spaces, no noodling, no jamming. Bassist Jack Donovan works through a distortion pedal that more than takes the place of a rhythm guitar, and drummer Matt Couto eschews the blastbeats for an old school, John Bonham influenced approach. There are headbanging and fistpumping parts, of course, but there are parts that are pure art rock. After 3 or 4 listens, the many complex parts begin to cohere, although after two months I still hear new things with each trip through. All of the songs have been my "favorite" at one point or another, but right now I can't get enough of "Deadweight," where a delicate 45 second intro morphs into a minute and a half of psychedelia, finally exploding into a full-on heavy metal assault. Like everything else on this album, it's brilliant. 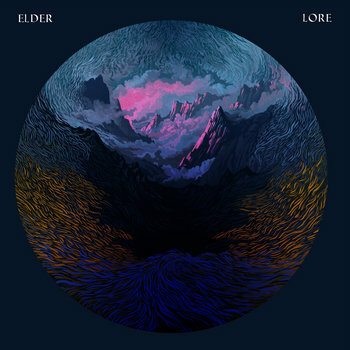 Lore was released in the US by Armageddon Shop, and in Europe by Stickman Records. You can download it for seven lousy simoleons right here at the Elder Bandcamp site. We introduced London band Chorusgirl here in late 2013 (link), praising their brand on noise pop for the fusion of jangle and grumble. The band, which was founded by Silvi Wersing, has been recruited by Odd Box Records to be part of its 100 Club series. Thus, Chorusgirl will have its first release on April 28 -- the two-song "No Moon"/"Dream On, Baby Blue". The release is limited to 100 copies of vinyl, with a digital download, but also will be available as a digital download. You can test drive the rootsy, atmospheric "No Moon" below. In addition to Silvi, Chorusgirl is Caroline, Udo, and Mike. Why settle for mass-produced, lowest common denominator pop music when you can have music created by artisans. Yes, real live artisans. In this case, The Artisans from the northeast of England. Their carefully handcrafted little gem "However Much I Love You I Love Lloyd Honeyghan More" is a masterpiece of musical craft. Ringing, jangling guitars over a sturdy backbeat and a melody that brings pleasant memories of Orange Juice and beloved C86 era bands. With a melancholy edge and a story about boxer Lloyd Honeyghan, this single is likely to be one of your favorite songs for a long while. You'd expect to pay artisanal prices for a song like this, and the band would deserve to get it. But in an inspired bit of marketing, and a frightening disregard for their financial future, The Artisans are making the song available for a free download. Yes even you can afford it. For the download, see the Soundcloud link below or visit their webpage. The Soundcloud link contains other songs from the band as well. The Artisans are Kevin McGrother (vocals/guitar), Nick Thompson (lead guitar), Steve Thompson (drums), and Karen Forster (bass). Telling Tales is four-song EP from UK five-piece The Fleas. To my ears, its primary purpose is to make the listener feel good. And it totally succeeds. A bit too funky to be folk, and a bit too dedicated to storytelling to be rock, it builds on energy, joy and diversity. Telling Tales opens with the enthusiastic folk jam "Free". You likely will play it over a couple of times before you play the other songs. That's OK, I did too, and the other songs are patient. However, to get to to move on, I'll point out that "Free" is a free download. The following "Born to Run" is a slick dose of energy. "She Doesn't Miss You" is a slice of indie soul, and it is good enough that you might feel bad about spending so much time with "Free", which by now you have downloaded anyway. The band leaves you on a big note with the rocking "No More Tears". The Fleas are Piers (lead vocals/guitar), Bernadette (vocals/percussion/glockenspiel), Mannie (vocals/drums), Woody (bass/upright bass), and Chris (lead guitar). Lilith Ai has seen a lot of life. Born in London, she ran away to the United States as a teen and lived on the streets of Queens, New York. Back in the UK, she is starting to make a name for herself as a singer-songwriter with a powerful voice and a gritty, urban perspective. The two-song "Hang Tough" will be released by Lo Recordings.